A career in cosmetology can be fun and exciting. You may meet interesting people. You may have the opportunity to help them look their best. Plus, the amount of money you make is ultimately determined by the amount and type of work you choose to perform. But, it all starts with getting that first job after you graduate from beauty school. Getting a job after graduating from any type of school may be a challenge at first. Cosmetology is an industry with plenty of room for growth and several career opportunities that exist in the beauty field that you may have not yet considered. Below, you’ll learn some useful tips that you may use to secure that first job after graduating beauty school. When you enroll in a beauty school, you may already have an idea of what you’d like to be doing in the field of cosmetology. Most students want to work in a salon but even that offers various opportunities depending on the type of salon. It’s important that you weigh all of your possible career options. By doing so, you may build your knowledge and expertise in a particular direction, making yourself more marketable to potential employers. For example, what would you like to do when you graduate? Not all students are going to enjoy working as a stylist in a salon. Would you like to be a beauty school instructor? Would you like to be a sales representative for a major hair care company? You may even consider being a trade show representative or a platform presenter at seminars. There are many potential career paths open in the field of cosmetology. If you want to work in a salon, you should understand that every salon is different. Usually, larger salons may offer a variety of services, including pedicures, manicures, facials, massages as well as cuts, colors and other hair-related services. If you don’t want to offer those types of services, you may find a smaller salon more suitable. Smaller salons usually focus on the core services (cuts, colors, perms, etc.). Knowing yourself is the initial step to getting your first job after beauty school. If you know the direction you’d like your career to take, you may start planning accordingly. Most beauty schools place a high priority on helping their students secure jobs after they graduate. They realize that getting a job after graduation is a primary concern for students. So, they work hard to maintain a high placement rate in order to persuade prospective students to enroll. Work with the job placement personnel at your beauty school. Because they work closely with employers, they may offer you helpful tips on how to make yourself more marketable. Also, don’t wait until graduation to begin working with your beauty school’s job placement staff. Talk to them well before you graduate. That way, you may begin to tailor your knowledge, abilities and experience to getting the job you want in whatever field you choose. One of the first places you should look for a job after graduating is the community in which your beauty school is located. It’s likely that salon owners and managers are familiar with the school. They’re familiar with the faculty and the quality of students that the school produces. This familiarity makes it more likely that they may be willing to extend an offer to graduates of that beauty school. This can be mutually-beneficial to the graduating student and the salon. The student gets their first job and is able to get the experience needed to gain a clientele and eventually charge more for their services. 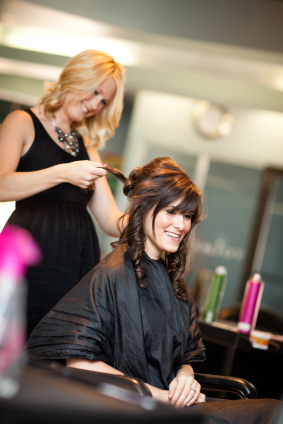 The salon benefits because they can attract new graduates who may be incredibly-talented. Don’t make the mistake of neglecting the salons that are located in the same community as your beauty school. This is a great way to gain a competitive edge on other graduating students. Most students search for a salon job immediately after graduation. They have the same training and similar levels of knowledge and experience. Try to set yourself apart by making yourself more valuable to potential employers. Take an advanced cutting techniques class from a well-known training company. Or, take an advanced colors class. This tells prospective employers that you know more than other graduating students. Plus, it communicates your dedication to the field of cosmetology. Your success in finding a job after graduating from beauty school may largely dependent on the work you do before you graduate. Many students wait until they take the state exams and get their license before preparing for a job. But, you may significantly improve your chances of finding the job you want by doing some of research and work ahead of time. Take time to learn about the salons in your community. Get to know the managers of those salons. Let them know when you’re planning to graduate. You may be surprised by how receptive many of them will be to offering you a position as a full-time stylist when you graduate. Establishing a relationship with these potential employers can give you a distinct advantage over other graduates. Try to work in a salon before you graduate from beauty school. You may often work as an assistant to the other full-time stylists. This gives you a couple of important advantages. First, you may get valuable experience in a salon setting while you’re still attending beauty school. Second, you may learn new techniques from experienced stylists that you may not be exposed to at your school. When you finally graduate and get your license from the state, you may be much more marketable to salon managers. There’s no trick to getting a job once you graduate from beauty school. Your success is largely a matter of the effort and research you put in before you graduate. First, ask yourself what kind of cosmetology job you want. Second, use your beauty school’s job placement services. Third, apply to salons in the same community in which your school is located. Next, make yourself more valuable to potential employers by taking an advanced class (or two). Finally, get to know the salon managers in your community. If possible, try to work part-time in their salons while going to beauty school. Doing these things may give you a significant advantage in finding your first job after graduating.